Hello, friends! I had an amazing day yesterday. My friend Justin and I spent the day in NYC, attending a release party from Mama Elephant. We also had a fabulous brunch, shopped at the Ink Pad, walked on the High Line, and strolled through Chelsea Market. The weather was perfect and it was an awesome day! 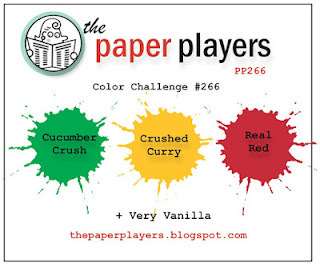 Today at The Paper Players, the talented Jaydee is our hostess, and she has a fabulous color challenge for us. I opted to use these colors in a holiday creation. I used two stamp sets and dies from Lawn Fawn for my CAS coffee themed creation. I think the cups look so cute stacked up. This was a fun and easy card to make. I stamped my images, colored them with markers, and that's it! 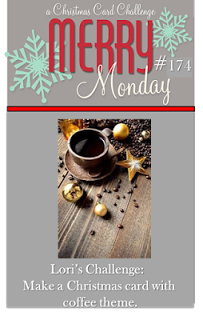 I'm also playing along with two other challenges, the sketch challenge from CAS(E) this sketch, and the coffee theme challenge at Merry Monday. Thanks for visiting! Please pay a visit to the rest of the Design Team at The Paper Players, and we'd love for you to play along, too! This is absolutely adorable! SWEETness personified! Sheer perfection for both challenges! LOVE!!! This is o cute! Perfect for both challenges. Love all the stamping. Looks so cute. So cute! 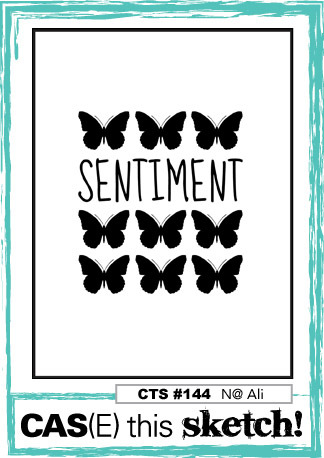 I need this stamp set! This is fabulous! Great take on the sketch and the colours make it super sweet, Sandy! Gorgeous coloring! I particularly love the shine on the mugs! :) Thanks so much for playing Simon Says Stamp Wednesday “Clean and Simple Christmas” Challenge! Super sweet take on the sketch! I love it! So fun Sandy! I love how you used the sketch along with the colors. Sounds like you had a great time in the city! Absolutely adorable card, Sandy! Your coloring is amazing and these coffee cups are so sweet. Great use of the sketch and the colors--just adorable. So glad you had a fun filled day of friendship and crafty shopping--doesn't get better than that!! Love your little festive cups and mugs - just perfect for this week's challenge! Nothing nicer than a warm drink on a cold winter's day. such a sweet adorable card, Sandy! Oh and what a fun day you must have had with Justin in NY! Isn't the high line a lovely walk?! Sandy, sounds like you and Justin had the perfect day in NYC :-) I LOVE your take on the colors. I have a friend who would really appreciate your wonderful, Christmassy colored coffee cups. A great take on the sketch - and colors.